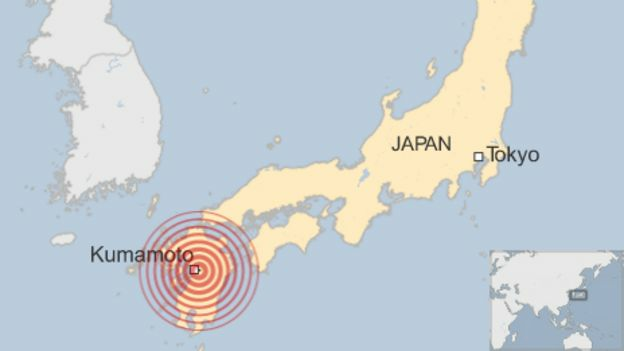 Japan (MNN) — Over 500 aftershocks have followed two major earthquakes near the Japanese city Kumamoto since last Thursday. The earthquake epicenters have been shallow so damages are concentrated in smaller areas, but they’re still extreme. About 42 people have been killed, and 2,000 are estimated to have been injured. People are still missing, some trapped inside fallen buildings. Roads have also suffered damages and are expected to suffer more. Mudslides are making it difficult to access villages and towns and heavy rain is predicted to come soon, triggering more. Electricity has gone out in a number of areas, stirring problems for those in need of medical attention. So far, 180-thousand people have been safely evacuated from earthquake-hit areas. The Japanese government is working hard to provide food, water, diapers, and basic clothing. They postponed access for the U.S. Military until yesterday, four days after the tremors started. “There are still missing people, so with the U.S. forces, we would like for the operations to go into effect as quickly and smoothly as possible,” Col. Mashahiro Sugawara of the Joint Staff Council of Japan’s self-defense force told CBS News. About 10 people remain missing in the region and rescue workers are digging through debris to find them. Looking back at the 2011 Tōhoku earthquake and tsunami, there’s an awareness that the damages won’t last for a day, but will last for months. Takazawa says one of the best ways to do that is by coming alongside the people and local church. That’s exactly what Asian Access is doing. The ministry is coming alongside indigenous people to empower them and restore strength. They’re providing supplies and encouragement, but ultimately they’re listening to what the people need. With indigenous partners, Asian Access is identifying which areas have been overlooked or haven’t received enough supplies from government aid. The people are terrified as the ground continues to shake in more aftershocks, and lights are out. “Night is very dark. So that physical darkness gives the people very uncertain feelings,” Takazawa says. The local and global churches are helping people feel more at ease through their provisions for both physical and spiritual needs. God is using the disaster as a way for churches to reach people with His message. Only about one percent of the Japanese population are Christian. But with the demonstration of love, there is hope for new followers. Asian Access asks for your prayer for the people in Japan. Pray for healing and that the people would hear the message of God.